For a glimpse into that laid-back and casual surfer lifestyle, Hermosa Beach should be your destination of choice among the trio of beachfront towns that stretch south from LAX toward the Palos Verdes Peninsula. So you're in the know, Angelenos call this trio, which includes Manhattan Beach, Hermosa Beach, and Redondo Beach the "South Bay." Hermosa Beach is the least formal of the bunch, a place where you're more likely to see a skateboarder than a spa. If you really want to unwind without the pressure of always looking put together, visit Hermosa Beach. Families, couples, and friends alike can always find something to do in Hermosa Beach. Read on to find out why Hermosa Beach is the best of the three South Bay beach towns. Why Should You Go? Will You Like Hermosa Beach? Hermosa Beach is a great place to get a glimpse into SoCal beach life, with a scenic pier, paved oceanfront walking path and lots of things going on. It's worth a few hours if you're on a short visit, or you could settle into an area hotel and use it as a base to spend a couple of days exploring more of the South Bay and things to do in Hermosa Beach. Runners and beach bums alike can enjoy Hermosa Beach and the SoCal lifestyle it has to offer. Sandy beaches are perfect for a mid-morning nap on a beach blanket. Oceanside trails offer great views during your run. Or you can just hang out with the locals at a coffee shop. Hermosa Pier: The Hermosa Pier affords great views and is a favorite spot for local fishermen. Bring your own pole to cast a line or watch others reel 'em in. Get Active: The beachfront sidewalk called The Strand is the Hermosa Beach thoroughfare for the active set, from bicyclists and runners to walkers. Joining them in some form of people-powered locomotion is the obvious activity, but people-watching is also excellent. You can rent bicycles and other beach gear at several shops near the pier. Shops up the hill from the beach on Pier Avenue also rent surfboards, and some offer surfing lessons. Shops on Pier Avenue: You'll find locally-owned shops selling beach gear and casual clothing, as well as some inexpensive places to eat. Comedy and Magic Club: Lots of locals know this, but few outsiders realize that Jay Leno hasn't completely retired. In fact, he performs here regularly on Sunday nights, something he did even when hosting his late night show. Fiesta Hermosa happens in downtown Hermosa Beach on Pier Plaza, Hermosa Avenue, and lower Pier Avenue throughout Memorial Day and Labor Day weekends. Read through the parking tips below, so you're not caught in traffic coming in or going out. If you live in California, you know this, but people from other places are often surprised to learn that early summer is not the best time to visit any California beach. Like most of the Los Angeles coastline, Hermosa Beach can be shrouded in foggy "June gloom" for days or weeks on end. It can start as early as "May Gray", sometimes lingering into "No Sky July". After that ends, days are nice. Rainy, winter days may be best spent elsewhere, but on a clear day just after a rain, the views are stellar. 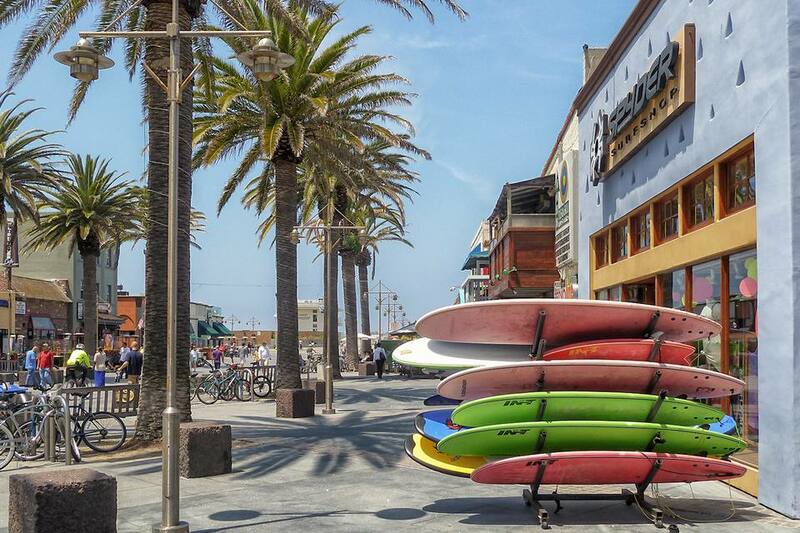 Explore Hermosa Beach and stay overnight to truly let that laid-back vibe sink in. If you have the weekend, you can spend a night in Hermosa Beach and a half-day at any of the nearby beaches. You'll find paid parking lots at Hermosa Ave and 11th St, Hermosa Ave & 13th Street and 13th Court at 13th Street. Otherwise, most other spots are metered. You can also use the ParkMe app to find parking lots and find out how much they cost. Or just take an Uber or Lyft to get there and avoid the parking hassles altogether. From LAX, the most enjoyable (albeit a bit slow) way to get to Redondo Beach is to drive straight west from the airport toward the ocean on Imperial Highway and turn left at the end of the road. Follow the beach as closely as you can to drive south through Manhattan Beach to Hermosa Beach. The quick way to get there from elsewhere is to navigate to 1 Pier Avenue, which is the address of the pier. Just be sure to stop before you accidentally drive right onto it.